The announcement did not go over well. A short time later we learned that we would all be graduating from Hogwarts... whether we wanted to or not. On September 22, they unveiled the new Pottermore. Immediate responses were largely negative. Many children, and not a few adults, were in tears. Media coverage of the change downplayed the negative reaction, if they acknowledged it at all. 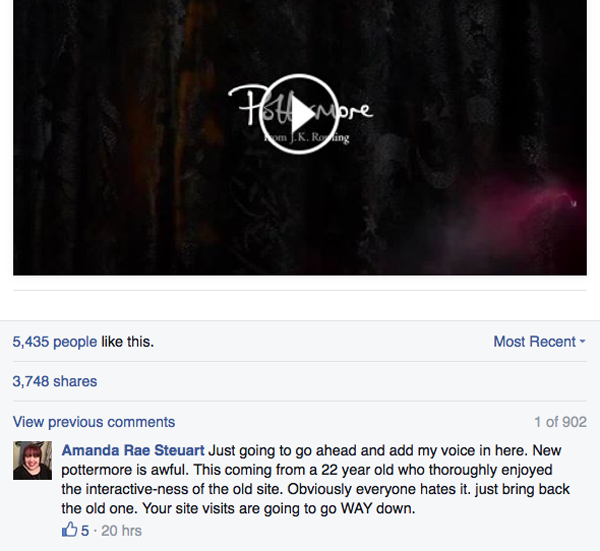 The press seems to be buying Pottermore's spin, that there's a mix of positive and negative reaction. 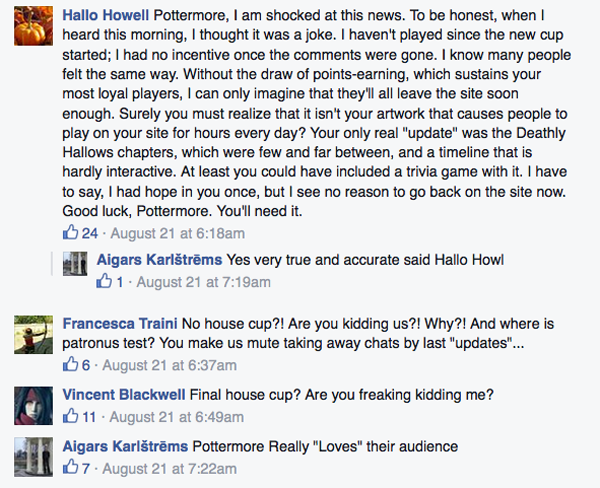 In truth, the response from Pottermore users was overwhelmingly one of shock, anger, and despair. And, Pottermore's administration just comes across looking like they're in deep denial, horribly cynical about their users, or both. Page administrators seemed all too ready to push these early reactions down the page with links to articles on the new site. But, the uproar didn't drop neatly below the fold to be forgotten. The shoddy articles with vestigial art from the beloved site – no longer multi-layered or interactive – was salt in the wound for a grieving fanbase. The furor, far from dying down, got a shot of adrenaline when the many disgruntled Pottermore fans learned what had really happened to all that lovely art. It seems the old site was carved up and sold to Apple for new Enhanced Editions of the books. Then, there were the disappearances. Even longtime users of the Facebook page found themselves blocked from commenting and their entire comment histories deleted. Admin did this quietly, the only indication being missing comments and replies here and there – comment counts going down instead of up. Sometimes the reply count is ghosted. For example, it might say 3 replies, when you click it, for a flash it says 5 replies, but when it opens there are only 2 replies. They've made this poor gal look like a crazy person, talking to herself. You agree with whom, dear? Oh, but it says 2 replies. It's only that her friend has gone invisible. She used to look like this. Only the perceptive reader, or one of the deleted, would notice that comments, and entire people, were missing. One minute you see them. 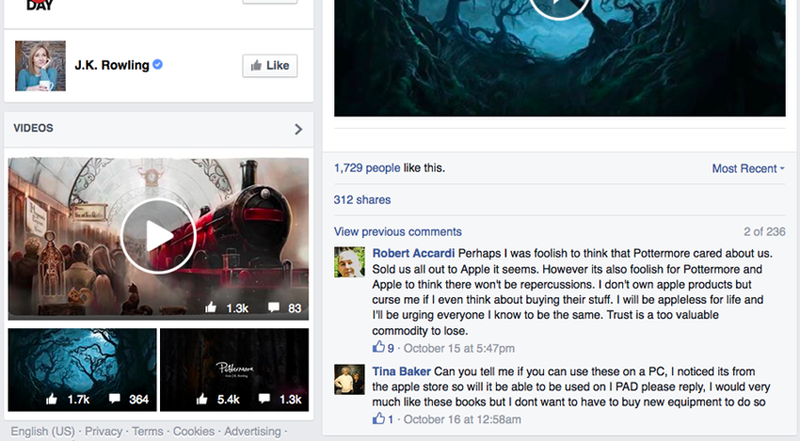 To get some idea of the scope of the problem, compare the video thumbnail in the margin to the current comment count. The thumbnail is either ghosting past numbers, or it's showing the actual comment count, including hidden comments. According to the the thumbnail of the Enhanced Editions announcement post, there are 364 comments. The number on the post is 236. Over a hundred comments are missing. 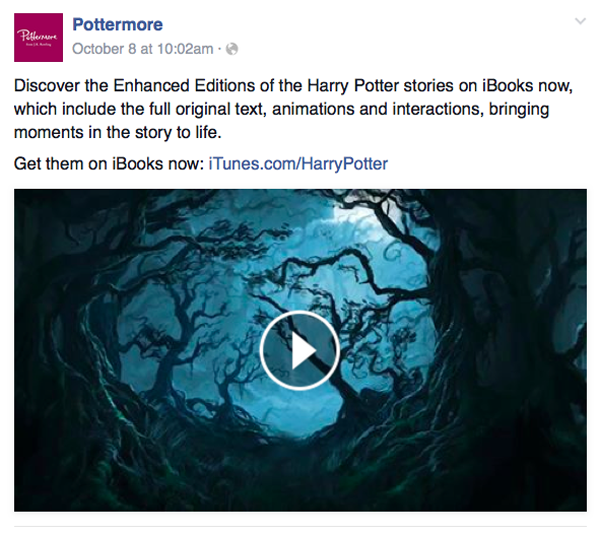 The thumbnail for the Pottermore announcement shows 1.3k. At the same time, the actual post shows 902, a shortfall of about 400 comments. 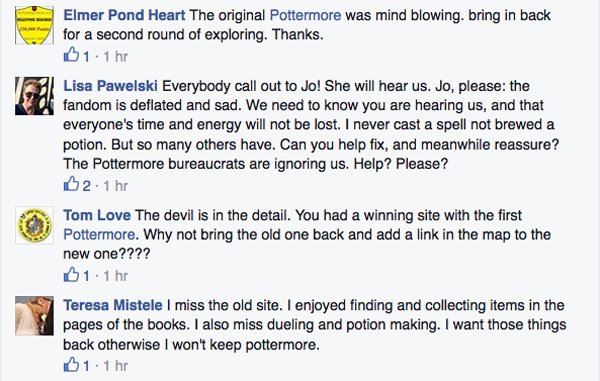 That these disappearances of loyal Pottermore members make the site administration look more like Death Eaters, doesn't seem to occur to them. It was an awesome rant. Needless to say, it's gone now. I chatted with Rune Marauder, of Rune's Potions Chamber, who was also banned from the Facebook page. Rune, who blogs on Pottermore related issues, made me aware of some of the deeper problems that have probably been affecting the site for some time. He reminded me that Pottermore and its development partner Sony parted ways last year. There was a lot of optimism and a lot of press, when this happened. 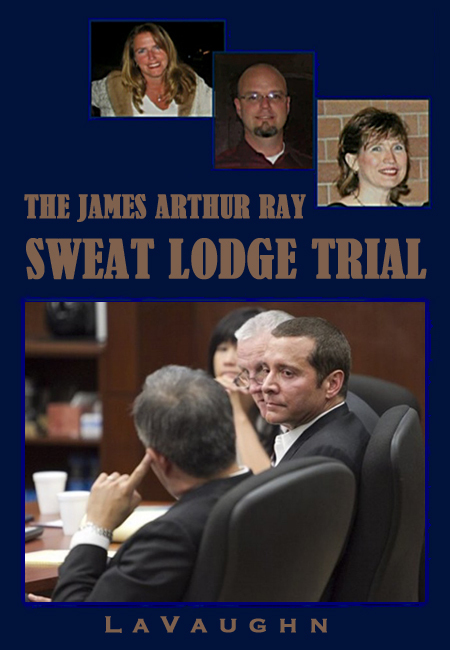 In fact, it was the media attention at that time that first made me aware of the site. In retrospect, I think this has been mostly bad for the company. Rune also directed me to some of the reviews on Glassdoor.com. The picture that emerges from these employee reviews is dismaying. Much like the spin for the new Pottermore, a couple of cheery reviews sit at the top, but that sunny optimism is belied by an overall rating is 1.8 stars. Most of the reviews are terrible, and at least one employee suspects the positive reviews are "fabricated by management." 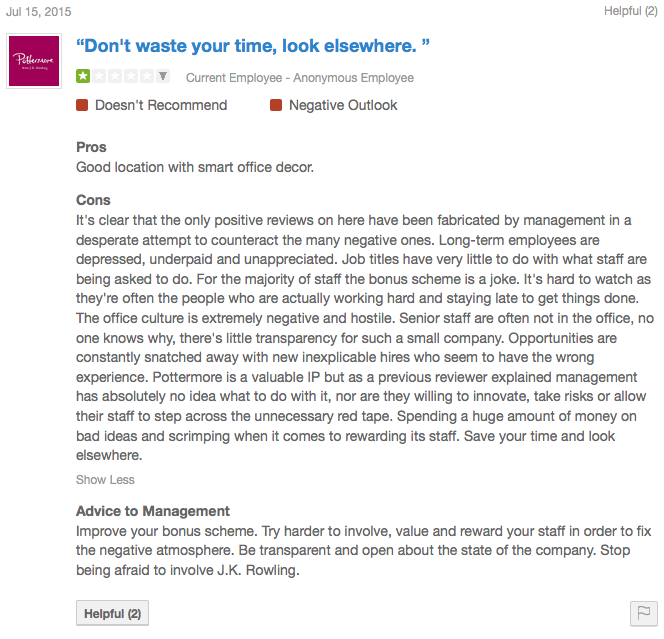 This comment also affirms something I've suspected from the outset, when it recommends that the company, "Stop being afraid to involve J.K. Rowling." My suspicion is that Rowling is more of a figurehead. She's an author, not a web developer. Special writings and some of the original concepts are what she brings to the table. Here, CEO Susan Jurevics describes some of her creative input, but explains that she's not involved with the day to day. To realize her vision in this medium, Rowling would need a great management team. It looks from those employee reviews like she doesn't have one. Much of the divine artistry for the original Pottermore site came from Atomhawk Design. The no longer interactive remnants of that work are scattered about the new site and gracing the digital pages of the Enhanced Editions. Otherwise the visual elements of the new site are so lackluster, so bereft of the detail and atmospherics of the original site, I sincerely doubt Pottermore is working with them any longer. This is incredibly unfortunate. Pottermore claims it will be phasing in accounts, sorting, and wands again, as well as the elusive Patronus test and some other activities. But, who in the Potterverse ever heard of being sorted more than once? The sorting hat's decisions are supposed to be final. Worse, who could trust Pottermore not to just dump their Pottermore identity, wand, and all their work again, to sell the new features to the highest bidder? That sounds like a sucker's bet, to me. 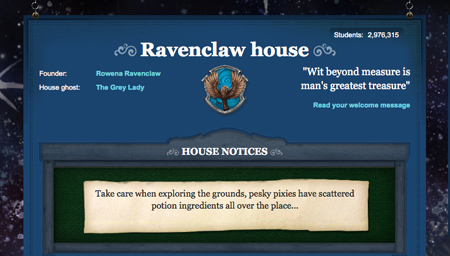 Why on earth would Pottermore roll out a new site with none of the promised interactive features in place? Why would they present, with all this fanfare, such a pale imitation of the beautiful site they vaporized. Something has gone horribly wrong. Whether it's managerial ineptitude or simple contempt for their legion of fans, I can't say. Perhaps it's a bit of both. The supreme irony here is that Rowling's work is such a sharp critique of authoritarianism. It is sad to see a once excellent site turn into a sad parody the Ministry of Magic as it became increasingly paranoid, defensive, and ultimately taken over by Death Eaters. The new Pottermore is like something designed by Dolores Umbridge: tightly controlled, a lot of reading, but with no practical application, no magic. 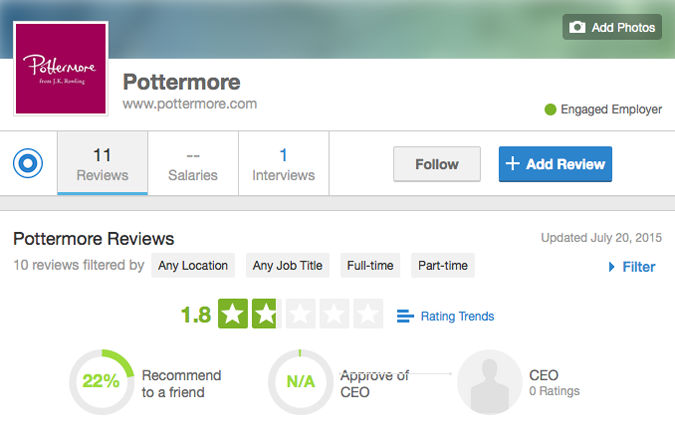 It's the new "secure, risk-free" Pottermore. 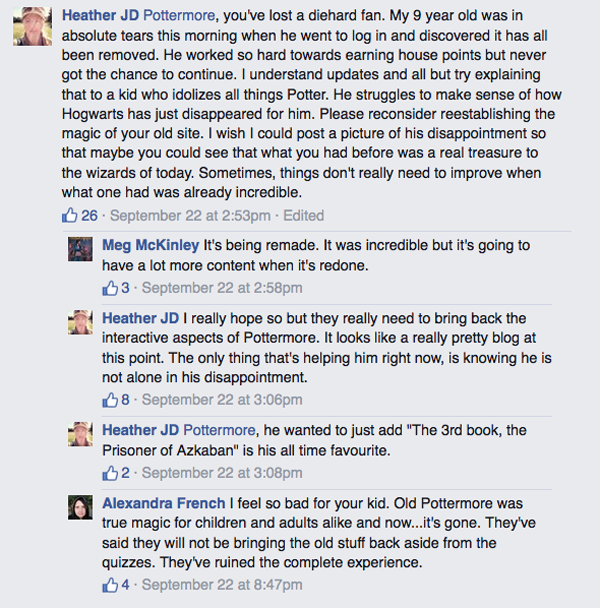 My aim in this post is to represent the response from Pottermore's disenfranchised fanbase. I couldn't possibly post the hundreds of comments that have disappeared. This page wouldn't load. But, I have taken many more screenshots than appear here. I will continue to upload them to my photobucket for this post. Here, also, are direct links to some of the earlier Facebook posts that were pushed down the page and effectively hidden. They've been diminished by the bannings and deletions, but there is still some excellent commentary to be found. 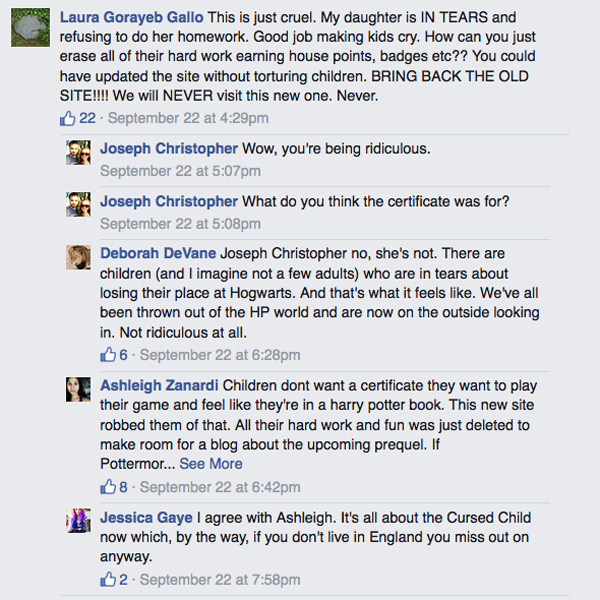 Also worth reading are these two posts on Mugglenet, assuming the comments hold. But, for now, this is the Watch Owl signing off. Addendum: I'm adding this slideshow of the entire bucket. 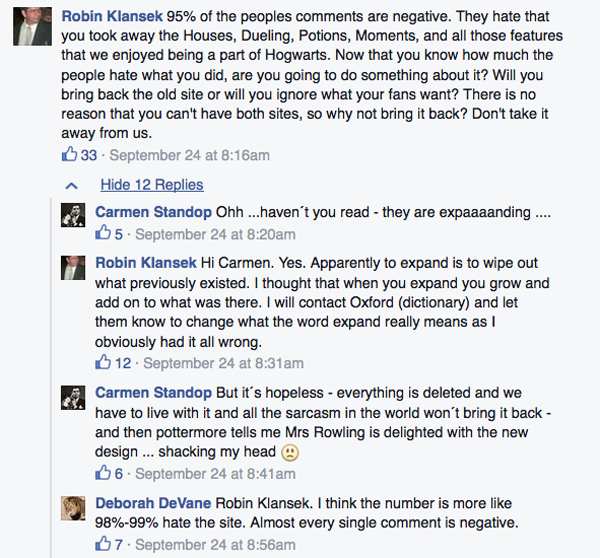 It contains a representative sample of the many comments ignored and/or deleted by Pottermore. It cannot contain them all, but I took scads of screenshots and I'll continue to upload them to my Photobucket account, as I can. Further Addenda: Members of the old Pottermore staged a Candlelight Vigil for the old site. It was snuffed by the Ministry. Find the details here. Thank you for giving us a voice with some sort of authority. We are the displaced, abandoned, but ever hopeful children (adults) of Hogwarts. We are still fighting for the return of our home.... Starr....SpellStar10905... ALWAYS! What about all the complaints about the old site? There were bi-weekly petitions about duelling, glitches, etc, etc you make it seem like a nirvana. We pay nothing for the site, I doubt many would be prepared to pay and yet people feel entitled to gripe about it (when from a economic perspective they make a lot of sense) without considering the hell Pottermore was put through before the change and the reasons that they made the change for. Also screenshots of Facebook posts do not constitute research but are effective in highlighting a biased opinion from a small user group. There are many other computer games for children (that actually work) and make it feel like you're in a Harry Potter book much more than PM ever managed. The lego ones are the ones that made the biggest impression to me. You also mention media coverage, yet your 'media' coverage remains completely biased towards a small user pool. Is is effective shock journalism yes, but it does not represent a balanced or rational argument, just a gripe about changes in which users had no stake. I congratulate Pottermore in blocking people from their page. There are people behind that page and they probably are only their to manage PM's social media, not make actual decisions or pass on any messages. As you, yourself point out they probably do not have a very happy work environment thanks to the glass door emails, yet people continued to harass and bully them to the point where banning or comment deletion was the only option. My point is that before you start yelling at PM the issue needs to be considered from their side and your reactions need to be rationale and sensible. As soon as the new site went live I was commenting the positives and negatives of the new site. They responded to me and said they would take my gripes into account. I was not yelling at them, I was respecting them. The Harry Potter series taught empathy, open-mindedness and that two wrongs do not make a right, however I sadly do not see this reflected in the Pottermore Community's response to the new site. Hi Lilys. I was going to reply to your post in the FB group, which I was just added to, but here works. "Also screenshots of Facebook posts do not constitute research but are effective in highlighting a biased opinion from a small user group." They do if what you're researching is those disenfranchised members, which I state plainly is what I was doing. It's not a small group. It's a very large group, comment after comment, person after person, voicing their displeasure and being mostly ignored by Pottermore. 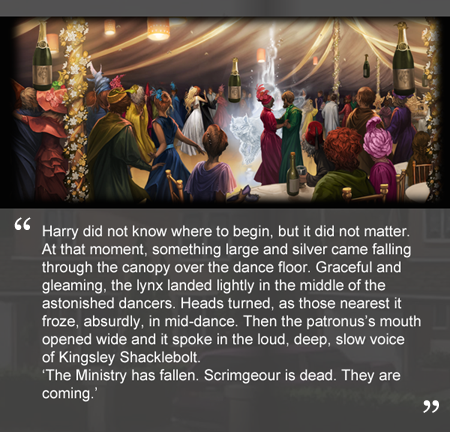 If you look at the Mugglenet pages I posted, you see the same. Many, many, many people are unhappy. 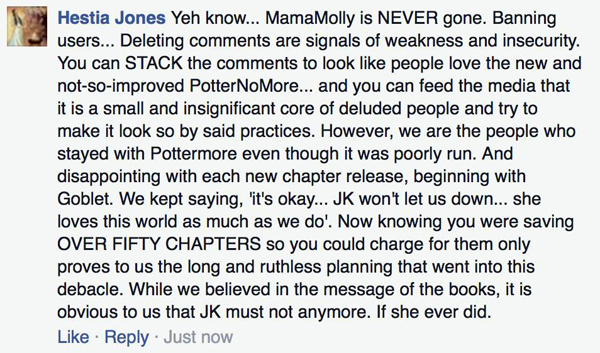 And, when Pottermore responds at all, they only offer non-apology apologies, of the sorry you're not happy variety. They come across as very dismissive of crying children and deeply disappointed users of all ages. "I congratulate Pottermore in blocking people from their page... yet people continued to harass and bully them to the point where banning or comment deletion was the only option." Harass and bully them?! I certainly did no such thing. And yet I was banned. Many people were banned and I think a lot of them would take exception to being told they were being harassive and bullying. People voicing their displeasure at a decision that affects them is not harassment. Disagreement is not bullying, not unless one is very thin-skinned. 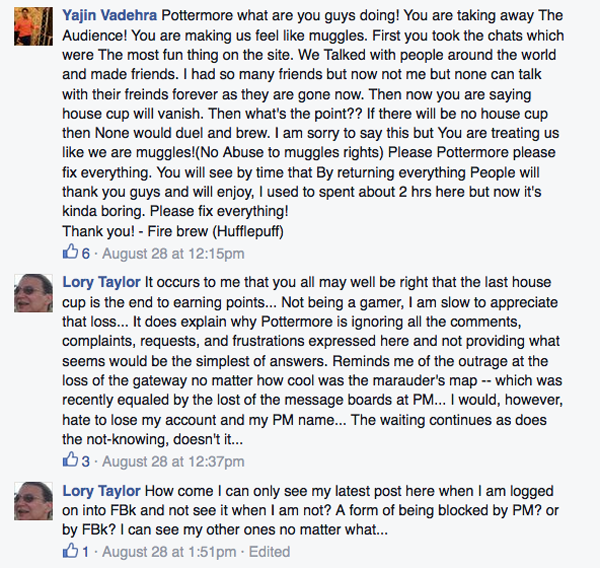 And that is how Pottermore comes off in this case, ridiculously thin-skinned. And yes, let's do put the responsibility where it lies, not on the employees, but on the management that is apparently making Pottermore a horrid place to work, that stifles innovation, that allowed that site to stagnate. It could have grown and developed and met user complaints about the glitches and gradual disintegration. Instead it threw away something truly beautiful and a whole lot of people, staff included I bet, aren't happy about it. ich danke dir für deine Recherchen. Ich bin nicht bei Facebook angemeldet,aber ich lese seit der Schließung von "unserem" Pottermore auf Facebook mit,und mir ist auch schon aufgefallen,das Kommentare verschwunden sind. Was glauben die eigentlich,mit wem sie es zu tun haben? Mit einem Haufen unmündiger Kinder? Es ist eine absolute Frechheit,wie die versuchen,ihre Facebook Seite zu manipulieren. Lilys-wie lange hast du das alte Pottermore genutzt? Ich war seit dem 14.4.2012 täglich on,und ich habe viele,sehr viele leute dort kennen gelernt-ja,wir kennen uns teilweise auch persönlich. Und ALLE wären bereit gewesen,für ihren Account zu zahlen !! Wir hätten es sogar begrüßt,denn dann hätten die Trollangriffe und teils sexuellen Rollenspiele aufgehört. Außerdem hinkt der Vergleich mit LEGO Harry Potter-denn das ist nicht interaktiv,und darum ging es uns:Leute aller Generationen und aus allen Ländern kennen zu lernen,die in ihrer Liebe zu Harry Potter vereint waren. Wir hatten in unserem deutschen Hufflepuff Gemeinschaftsraum Leute von 8-74 Jahren !!!! Das bringt uns weder irgendein PC Spiel noch die neue Pottermore-Seite. MitternachtWolf30325 / eine stolze Hufflepuff..ALWAYS !!! Thank-you so much for your comment. I don't speak German, so I've put it through Google translate. I will post the translation in a separated comment. I thank you for your search. 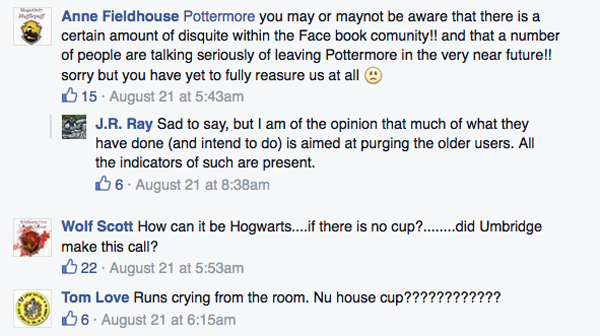 I am not logged in to Facebook, but I read since the closure of "our" Pottermore on Facebook, and I also have noticed, the comments are gone. What do the actually, with whom they are dealing? With a bunch of under-age children? It is an absolute impudence, as the attempt to manipulate their Facebook page. Lily-how long you have used the old Pottermore? I was on a daily basis since 14.4.2012, and I have many, very many people there know-yes, we partly know personally. And all would have been willing to pay for your account !! We could have even welcomed, because then the troll attacks and partly sexual role playing had stopped. In addition, the comparison with LEGO Harry Potter is lagging because that is not interactive, and that's why we were doing: people of all generations to meet from all countries to learn who were united in their love for Harry Potter. We had in our european Hufflepuff common room people from 8-74 years !!!! 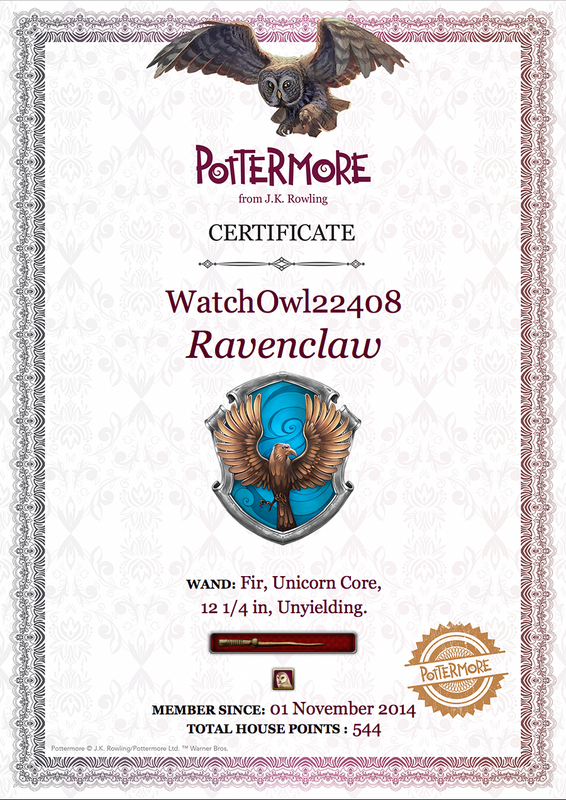 That brings us neither any PC game or the new Pottermore site. LaVaughn, keep it up !!!! MitternachtWolf30325 / a proud Hufflepuff..ALWAYS !!! This is the most precise assessment that I believe to be out there. Thank you for speaking truth, very well said. And hey, at least they can't recall our books!